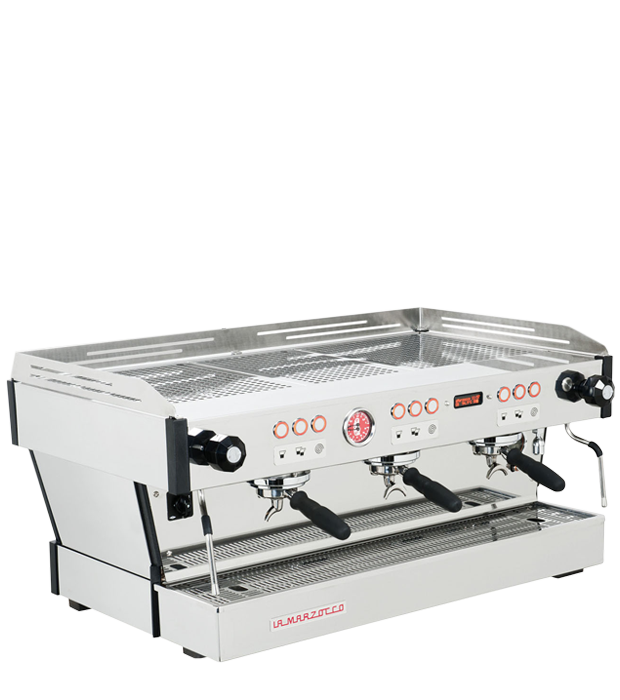 The La Marzocco gb5 is elegant engineering which has redefined the standard for temperature stability in modern espresso equipment. Ruby flow restrictions resist scale formation and erosion. Enables you to fine- tune the tap water temperature for tea. Stainless steel Portafilters and precision basket improve your cup quality and consistency. As water passes through each element temperature is further stabilised. This machine requires a 15mm cold water feed with isolated stop valve ¾ inch- BSP screw fittings used (standard for washing machine). 1-5 BAR pressure is needed to run the machine. This machine requires 32amp Single Phase or 3 Phase power supply – 16 amps per phase. Hardwired or command plug and socket. Please confirm when ordering. This machine requires 1 ½ inch down pipe, 8 inches minimum connected to a P trap below the machine.